Huge apologies all, I'm a day late with this month's giveaway. Had a morning of admin before heading off to the hotel to sort the final arrangements for our June and November retreats and then headed off for a quick visit to Pink Tulip to catch up with Darren, Sheila and Tracey. Bumped into my lovely teamie Debs too and Kate which was lovely. After a dash home I rustled up a few pancakes, a quick spag bol and then got completely carried away making some new samples for some Create and Craft shows I'm doing next month, oh and a card for a friend of Harrys. That one was a real last minute.com request as he headed off to bed. I had no idea it was past midnight already!! To be in with a chance to win just leave a comment on this post before midnight on 30th March. The winner will be announced here on the blog and my You Tube channel on 31st March. With this years DT call for G45 well under way and entries flying in I thought I'd share my latest DT box with you. Our boxes are always jam packed full of everything you could possibly need to get creative with their fabulous products. Thank you Diane, Charee, Amie and team for packing in all the G45 love to share and be creative with. Beautiful Creation! Absolutely love the flowers and colors. WOW!!! 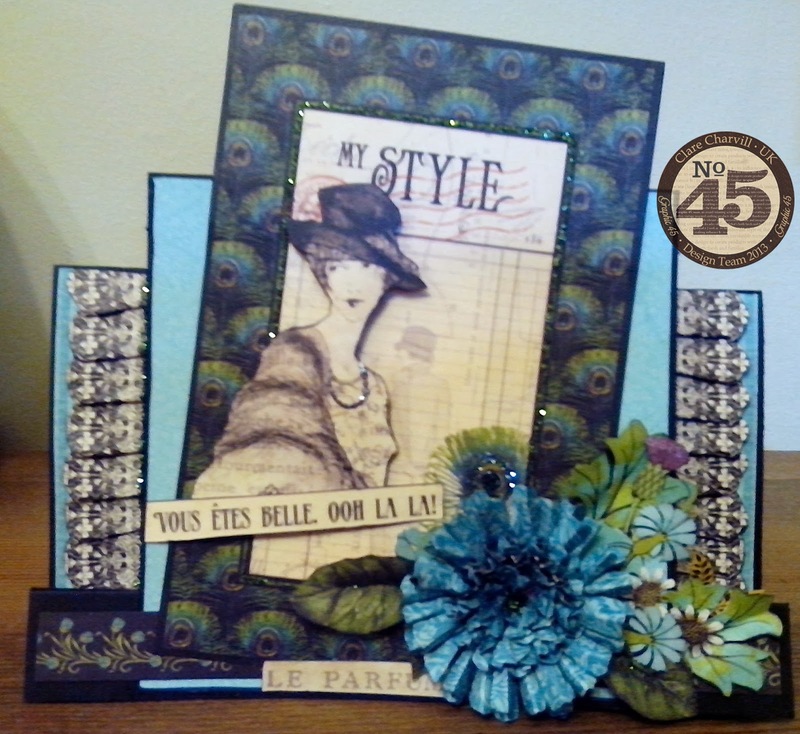 Your G45 box is awesome with many goodies..Waiting to see your creativity using those.. Thank you for the chance to win the awesome giveaway! Your blog and videos are very inspirational to me! I love the colors in the sport collection. It would be great to win it, although I'm not sure overseas entries are allowed. I quite enjoy your blog and all of your creations/tutorials...thanks very much for all of the inspiration as well as an opportunity to win some g45 stuff! Wow, what a lovely parcel to receive!! I'd be in paradise!! Would love to win your contest, Clare! I'm new to following you, but I am soooo glad I found you! You are incredibly talented and I've learnt a lot already! Wish I lived in the UK so I could attend your classes! Thank you for sharing what you do! Whew you sure had a busy day yesterday. 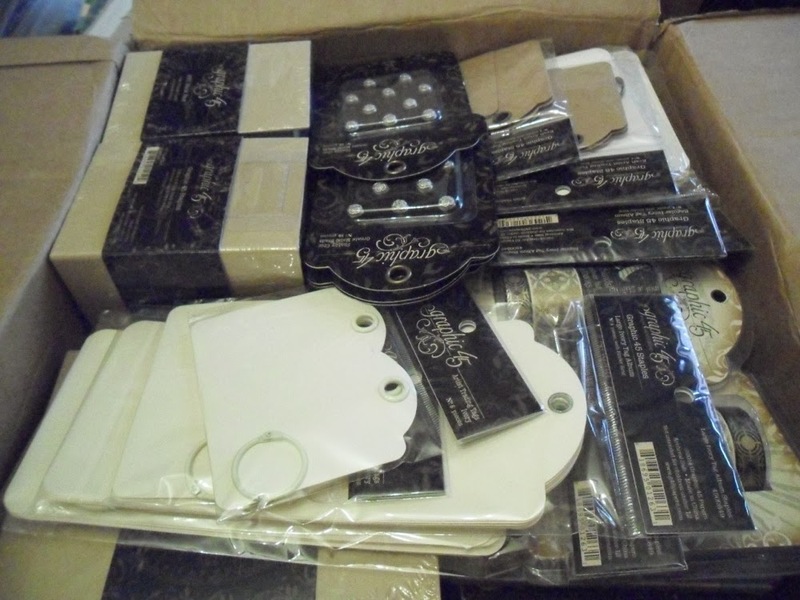 Loving the look of the fabulous giveaway and those boxes look like they are jam packed full of G45 goodies. Loving your creation too. Beautiful card, colours and design - great card, Your DT must love receiving their boxes!! Another box of gorgeous goodies. Are you applying to be on the G45 team next year? Lucky you Clare, your box of goodies looks amazing. I don't think I would know where to begin. I would just sit stroking it all! Morning Clare, Your card is stunning, and I especially love the glitter edging. Your March 'Giveaway' is lovely, lovely, lovely, I would love to give this 'a home'. I would have been 'swooning' with the ecstasy of your Graphic 45 box, all those gorgeous goodies to stroke and play with, you lucky, lucky girlie. Looking forward to seeing what you create with these gorgeous goodies. I'm off to Church shortly for the 'ashing' Service. Could it be this month is lucky for me? Georgeous card as always Clare . 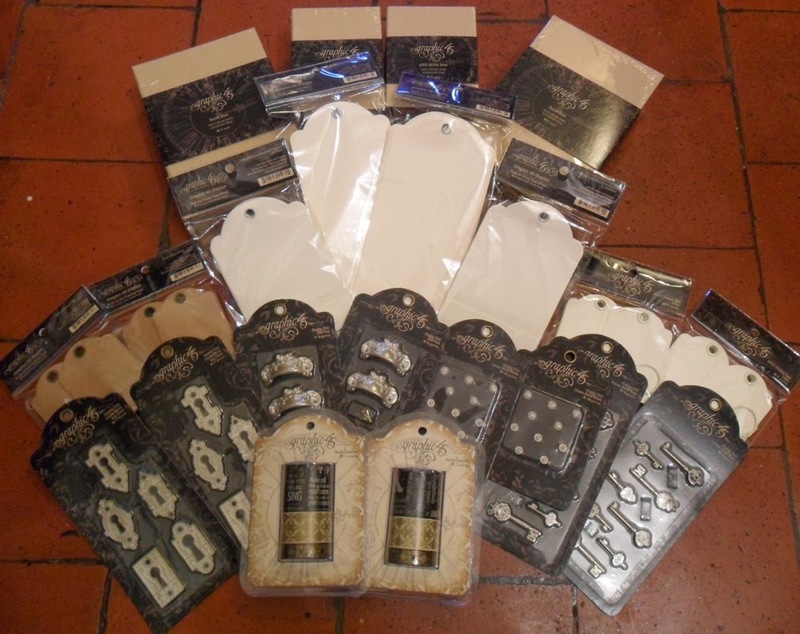 Fabulous goodies, what a treat it would be to win so thank you for the chance. Love the card and the image is gorgeous, oh so elegant. Gorgeous card, Claire. I so love your creations. It must be so very exciting to open your DT boxes and see all the gorgeous goodies. Thanks for the chance to win your giveaway. OMG i just felt in live with this collection !!!! Lovely card. The giveaway looks good for 'men' cards in particular - thanks for the change of winning. Lovely! Thanks for the chance to win. Wow, stunning card. Love the Couture collection. Thanks for the chance to win. You have been a busy girl Clare!!! Love the card, it's beautiful!! The box of goodies from Graphic 45 is a must see. I always loved when you did the videos opening the box and exclaiming over the goodies inside!! So many things to make and so little time, lol!!! Take care, always look forward to seeing what your next project is. I always enjoy your creations oh-so-much. You are such an inspiration to me. Thank you! Great card. Thanks so much for sharing all your great ideas. what a great vintage and beautiful card Clare. The card is beautiful! Thank you for sharing and for the chance to win. So very beautiful Clare, love the colours and the big flower, super image. What a great giveaway. I've just bought the 'By the Sea' paper pad and can't wait to start using it. 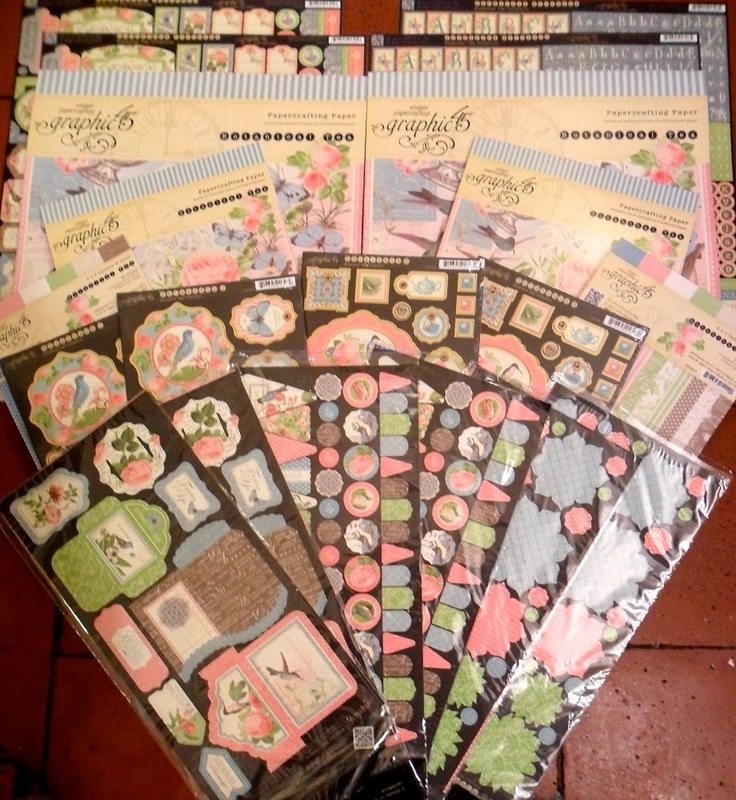 My most favourite paper company and this collection is only to add such fun. Thank you for your videos and sharing so much with us all. thank for opening this give away to all!!! ur very kind! hugs from spain. Thank you for sharing your talent and ideas with us, as well as the giveaway. The projects you make are so very pretty. Don't you just love it when new G45 designs come out, thank you for sharing. beautiful card and great giveaway! fingers crossed!!!!! Happy Crafting! Thank you for your inspiration and for your kindness for these giveaways every month. I also want to say thanks for opening it up to those (like me) who don't live in your country. Love watching your vids! This pad would be perfect for me to craft for my three boys! Thanks for the chance! Everything is so pretty!! I love the colors and designs of it all!! It's just simply perfect!! By the way, love your videos and your creativity, thanks for sharing it to us!! Wow gorgeous card. Isn't it just like them to leave everything til the last minute? I've had the same happen to me, lol. Thanks for the chance to win this great giveaway prize. Good luck everyone. I admire your creativity. I have made some wonderful mini albums thanks to your tutorials. Thank you! I love to see your beautiful work on youtube as your Dutch follower! Wow such a nice dt box, you are gonna make stunning projects with it, I'm sure of that! Thank you for the chance to win such a nice price pack! Thanks for the opportunity to win. I have a few fathers day items that would be perfect with this line. Thanks so much for your wonderful videos and the opportunity to win this prize! Great giveaway as usual. You are so lucky to get all those goodies, but then you have to work hard to earn them, I wish I had half your creative spirit! Thanks for the chance to win! I just love your work and you give me hope lol!! Love this paper and so much for this opportunity to win some!!! Ok, I am having a tough time believing you whipped up this gorgeous card in a minute. Wow, impressive. Wow my dream to own graphic 45 paper. Thanks for the chance to win it. love the g45 line! would be awesome to get on a DT. thanks for the chance to win some of their great stuff! The paper line is really nice .Can't wait to try it. Thanks for the opportunity to try and win some great products. Love this paper! Would love a chance to win it!!! Thanks so much for the opportunity....Graphic45 is always stunning a must in everyone stash!!. Here is my entry. I think this paper will be good to use for masculine projects. Love the creations you make for Graphic 45. wow...!!! beautiful paper.... and great music !!!! Love, Love, Love. Thanks so much for the chance to win. Graphic 45 has become one of my faves. Wanted to get this in my last scrap order but decided it would have to wait, so it would be fabulous to just win it instead, thanks for the chance! As always, your work is inspiring. Thank you for this opportunity to have a chance to win :) Absolutely love the things in this giveaway. Thanks for your inspiring things! Thanks Clare for this giveaway! The first time I ever saw G45 papers was in a project that you made few years ago. Thanks for that also, because since then G45 has all my favorite papers!!! It really must be like an extra special Christmas present to open one of those G45 DT boxes! I just ordered some G45 papers, can't wait for new projects for that by the sea! I love this card. Beautiful colors and cute flower. I have subscribed to your videos for a long time now. Absolutely love the way you create albums especially, designing just with paper and very little embellishments. The tutorials are also very easy to follow. Thanks for sharing your creativity. Thank you for the chance to win! You always make such lovely creations! Wow! How generous of you to offer these to us. I have been watching your videos for a while now and have learned quite a lot. Thanks for sharing your talents! Thank you Clare for sharing your talent, I love watching your channel and seeing your projects, they are always well constructed. Your tutorials allows us to do our own spine on your projects, which is awesome, looking foreward to many more projects in the future. What a fab box, all those lovely goodies. I'd be in heaven. Hope to win! I love everything G 45. I've been looking online at this paper. Definitely come in handy with the sports addicts in my home. Its beautiful paper. I have ideas but can't wait to see all you do with it. Thanks for all the inspiration. You really get the artistic juices flowing! Wonderful box of G45 goodies. Just makes you want to stroke it and look at it in awe. Thanks for the opportunity of winning some of these awe inspiring goodies. This is my first visit to your blog. I'm having a blast looking at everything you have going on! So much fun inspiration! The boxes that you have pictured, are they available for sale? I'd love the chance to win one as well. Thanks for sharing your talent! Thanks for the opportunity to win. You are truly an artist and an absolute inspiration! Love your work! Can't wait to see your creation! Love your videos :) thanks for the opportunity. Thanks for a chance to win this fabulous prize!! 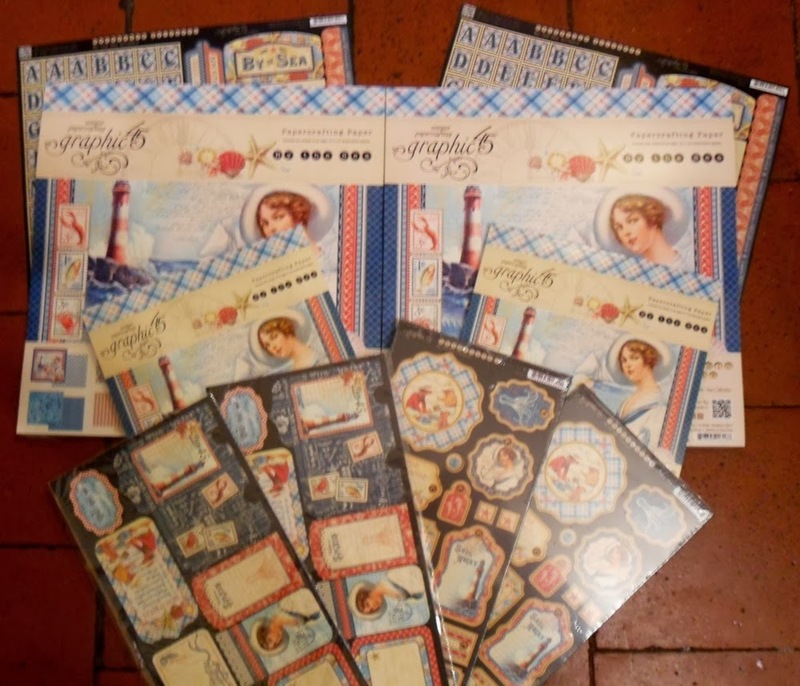 Clare and graphic45 paper... Beautifull designs and a great team together. I don't think I've seen any Graphic 45 I didn't love. Already thinking about what I can do with this one. oh, I'm new, very new here but I'm learning a lot from you and I love, love your work and good taste. It's so nice to win this giveaway. Thank you. a little kiss from Tenerife, Canary Island, Spain. You are such an inspiration. I love your work. Thanks for the chance to win this wonderful package. First of all I want to thank you for the chance to win. Your card is beautiful, love the colors too. And last of all, that box of G45 stuff would be wonderful to receive, WOW! Love ya Clare! I love love love your art Claire! I am your BIGGEST fan in the United States and would love for you to pick me! Just love those tags - they're perfect. Some may say "a tag is a tag" but it's not! That's a great giveaway, I`m entering this for my teen who loves these. Enjoyed ur demos @ Isobel's on Saturday thanks. Great prize! Always something lovely for you to show us! 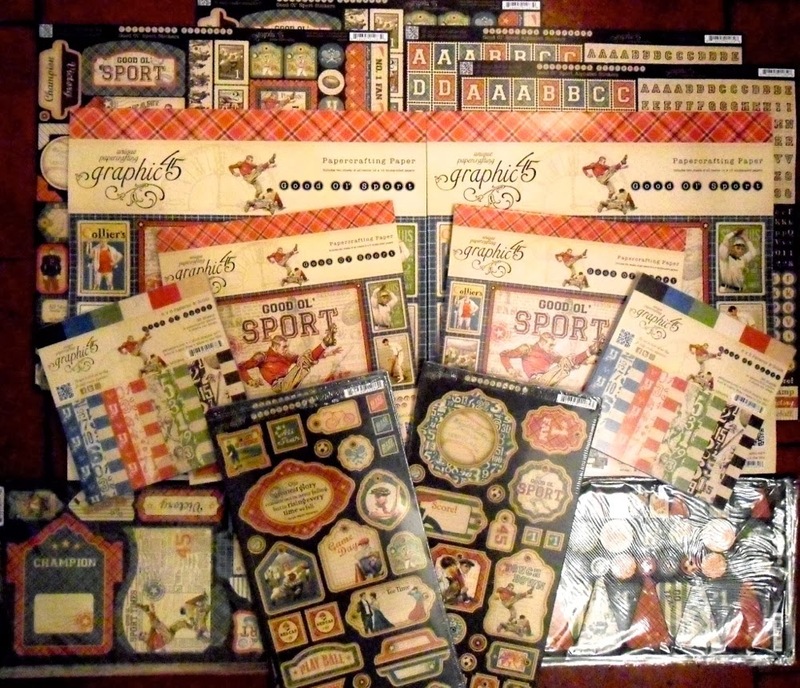 Fascinated w/ the Good Ole Sport paper - great giveaway! hello. love the paper. it will be good to see you on create and craft again. Beautiful card and an awesome giveaway!! I'm brand new to the art of album making; in fact I made my first mini album and found you wonderfully amazing site all in one day..... today!! I'm totally in awe and already making plans for Christmas gifting. My passion is reborning dolls and when I sell one I like to add a few extra's such as pictures, birth and adoption papers, care instructions, etc. I was looking to present these things in some special way when I came across your albums and couldn't help but fall in love with them. Thanks so much, I'll definitely keep watching. Lovely projects and a great giveaway. Love your blog and the tutorials. I'm so in love with everything you do. I watch all your videos...multiple times. Thank you for sharing your talents. I love this one! I am a tea lover and also a card maker, making my first "card in a box" on Saturday. Thank you for sharing your cards and giving everyone a chance to win. Thank you for the chance to win this great package of goodies. Love all of your beautiful projects. Always looking forward to all your new projects. Thank you ! Thanks for the chance to win a wonderful box of goodies from you Clare!!! Love, love, love, everything that you do, your tutorials are absolutely the best, always looking forward to the next one!!! What a beautiful card! Such a great pack of give-away goodies! It would be tremendous to win. Thanks so much for a chance to win!!! I already have plans for my grandsons sport pics and these papers would be perfect for them!!!!! Love your work and enjoy your videos so much!!!! Graphic 45 seems to only get better and better!!!! Stunning - what a lovely looking parcel! I wish I had just half of your creative genius! I love, love , LOVE your tutorials. Oh these will make fantastic gifts!